HP Umpire Jordan Baker ejected Dodgers Coach Bill Haselman over an illegal equipment/glove dispute in the top of the 3rd inning of the Brewers-Dodgers game. With one out and one on (R1) in the top of the 3rd inning of the Brewers-Dodgers game, Dodgers second baseman Logan Forsythe was prohibited from wearing a first baseman's glove, as in Rule 3.05, during a bunt situation in which first baseman Scott Van Slyke had strategically relocated closer to home plate in order to field a bunt attempt from Brewers batter Matt Garza; Van Slyke retained the first baseman's glove for the duration of the play and inning in question, the call was correct. * At the time of the ejection, the game was tied, 0-0. The Brewers ultimately won the contest, 5-4. This is Jordan Baker (71)'s first ejection of Spring Training, the 2017 MLB preseason. Jordan Baker now has 0 points in the UEFL Standings (0 Previous + 0 Spring Training = 0). Crew Chief Jim Wolf now has 0 points in Crew Division (0 Previous + 0 Spring Training = 0). *Believe it or not, we've previously encountered and solved a Case Play about this very (or somewhat similar) play. In 2015, we asked, "Will the Real F3 Please Stand Up?" and posed the question, "if an outfielder stands at first base in a five-man infield, what is his position called and who may wear the first baseman's glove or mitt?" > Rule 3.05 allows the first baseman to wear a glove or mitt measuring 13"x8" with a web of width no greater than 5", as opposed to a fielding glove, as in Rule 3.06, whose corresponding maximum dimensions are 13"x7.75" with a web no wider than 4.5". There are additional stylistic and material differences between the two categories of gloves. > The OBR Definition of Terms defines the battery [catcher/pitcher], but not specifically "first baseman." > Rule 4.03, regarding the lineup cards, states that "each lineup card presented to the umpire-in-chief should list the fielding positions to be played by each player in the batting order." With that said, the answer lies within the rarely-referenced Rule 9 (formerly Rule 10 in 2014-era OBR) concerning The Official Scorer. 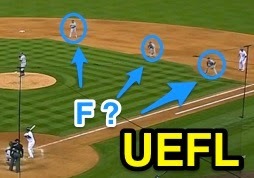 Rule 9.03(a) Comment tells the tale: "When a player does not exchange positions with another fielder but is merely placed in a different spot for a particular batter (for example, if a second baseman goes to the outfield to form a four-man outfield, or if a third baseman moves to a position between the shortstop and second baseman), the official scorer should not list this as a new position." 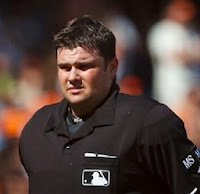 Accordingly, because second baseman Forsythe did not actually exchange positions with first baseman Van Slyke (since Van Slyke did not assume the customary second baseman's position between first and second base), and because the Forsythe/Van Slyke shift was only in place for batter Garza and his expected bunt attempt, Rule 9.03(a) Comment applies and the two players' positions remain unchanged: Jordan Baker was correct, Forsythe was not entitled to wear the first baseman's glove/mitt because Van Slyke remained the first baseman during this play. This is the sixth ejection report of Spring Training 2017. This is LA-NL's 2nd ejection of Spring Training, 1st in the Cactus League (LAD 2; CWS 1; Others 0). This is Bill Haselman's first ejection since May 7, 2002 (Gary Cederstrom; QOC = U [USC-NEC]). This is Jordan Baker's first ejection since Sept 26, 2016 (Sean Rodriguez; QOC = U [Fighting]).